Year 6 took their musical talents to Manor Court Lodge this week, for the much loved annual visit to our neighbours. The children performed Christmas songs and sang carols with the residents, then spent a little while after chatting over juice and biscuits. A lovely afternoon for both our children and the residents at Manor Court Lodge – “the children performed so well and it’s a lovely chance for them to showcase their talents, get some experience practising in front of an audience and also a lovely opportunity to chat about something different with the residents! They really love watching the children and we were so proud of how well they engaged and chatted at the end”. Anthony Glenn visits again, this year in the form of Oliver Twist! Years 1-6 watched the fantastic performance and Years 3, 4, 5 & 6 took part in the drama workshops over the afternoon. The children really enjoyed themselves and loved learning about a new play. “Anthony makes it accessible for all year groups and such a fun afternoon! In the workshop they were understanding the roles of poor and rich in Victorian era. Recreating key scenes from the story. The children really engaged and had produced interesting scenes by the end of the afternoon” – Mrs Kehoe. Year 1 and 2 Christmas Crafts sessions are always a highlight for the children – they love seeing mummy or daddy and spending some time together, getting creative! We made lanterns, stars and Rudolph hats. More photos over on Facebook! New focus for our merits this week, fitting in nicely with the Christmas spirit – we move onto “sharing”! Santa’s Little Helpers snuck in on Friday to help decorate the hall! The roaring fire and beautiful hand made Christmas cards really set a Christmassy tone – big thank you to Snaresbrook Staff for the Festive Transformation! Year 5 took a trip down to perform for and visit the residents at Manor Court Lodge yesterday. The children were really looking forward to their mini Christmas concert for the ladies and gentlemen. They started with some carols and then moved on to perform flute, guitar and viola renditions of Christmas songs. “Very confidently played and a wonderful way to get into the festive mood!” Residents thanked the children when they had a chance to chat at the end. Miss Maskell was so impressed with how engaged in conversation her class were, whilst they enjoyed some juice and biscuits. Miss Maskell received lots of compliments from the residents to say how impressed they were with the quality of the children’s performances and how delightful the children were too. Mrs Phillips also mentioned that many residents said how well the children were behaved and how polite they were! We’ve even been invited back for a Summer performance! Really well done to our lovely Year 5 class. The Last Day of Autumn Term! It’s been a fun and hectic term, with lots of festivities, singing, performing and learning, but most of all having fun and thinking of each other at this time of year! On the last day of term we started off with our usual Good Marks assembly. The Blue team smashed their house points for the whole term and came out on top! Well done to the few pupils who received the most good marks this term, they each received a £5.00 book token! Merits this week were awarded for ‘sharing’, a big well done to all our pupils who received a merit award! Mr Hawkins awarded his whole Year 4 class with a Class Merit for sharing their confidence and doing so well in their Christmas Church Service yesterday! Mr Hawkins seemed very proud. Mr Curl then went on to ask one of our pupils about their recent performance in Cinderella. He performed to a large audience in Chipping, Ongar and played ‘Little Buttons’. We all saw some photos from his performance and applauded his hard work! We then presented some pupils with certificates they had earned outside of school. Some of which were for Grade 9 in Gymnastics and earning Distinction in a drumming exam! Fantastic. We certainly have lots of hard working, talented children here at Snaresbrook Prep! Commendations this week were awarded for ‘working hard on a piece of creative writing’ and ‘awareness and consideration of others’ – what an excellent reason for a commendation award! Well done. Mr Curl mentioned that it was lovely to see such a colourful audience looking back at him, and some fantastic Christmas Jumpers! Donations have been collected and amounts raised will be announced in the coming week. “Thank you all for coming to this year’s Christmas performance! Well done to all our fabulous performers and singers! Everyone had a fantastic morning – we are all very proud of our children. A very heartwarming performance and a wonderful way to end our year. Last day of 2015 term tomorrow, let’s make it a special one! What an exciting afternoon!! The children at Snaresbrook Prep were very lucky, Father Christmas paid us all a visit and delivered some presents too! Nursery & Reception listened very carefully and heard the bells of his sleigh coming from the Nursery garden, then in walked Mr Father Christmas! We were all very happy to see him. Year 1 & 2 also met Santa and had their school Christmas party, filled with dancing, musical statues, musical chairs and prizes! The children had a blast at their Christmas Discos last week! Thanks to our SPPA for organising a fantastic event, there was magic, dance-offs, foam, treats and prizes! 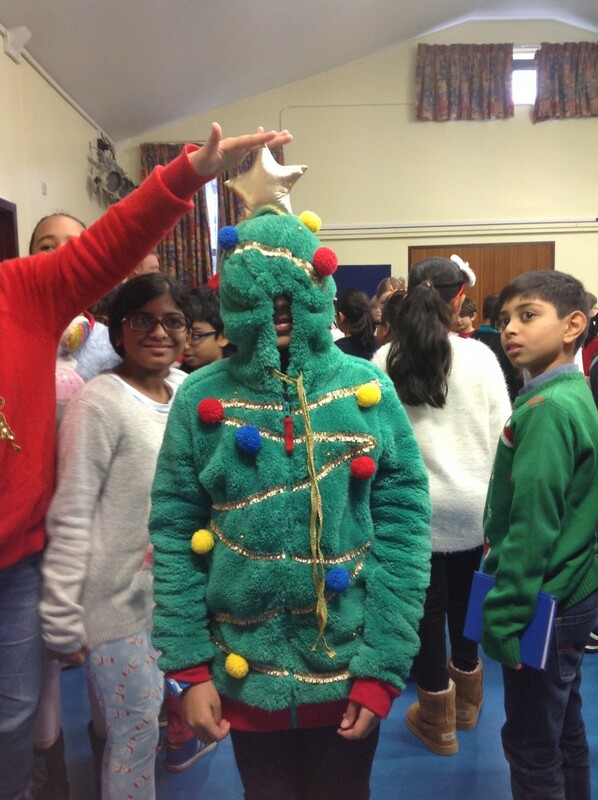 It’s that time of year – the Snaresbrook Prep Christmas Tree has popped up and the Year 6’s took a chance to add some baubles! Along with a helping hand from Mrs Redding! The SPPA are also taking the time to decorate the hall – photos to come next week!